Seth Moglen. 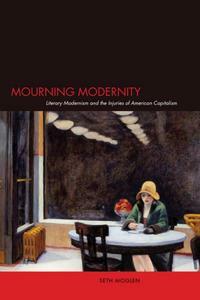 Mourning Modernity: Literary Modernism and the Injuries of American Capitalism. Stanford University Press, 2007. On its face a study of American literary modernism, Seth Moglen's Mourning Modernity opens onto an urgent question: how to remember and use histories of political radicalism. Moglen's book reanimates a turning point for American revolutionary movements in the 1920s and 1930s, tying that era's comprehensive state repression of the left into the development of a distinctly melancholic modernist sensibility. By returning to this conjuncture, Moglen makes an important contribution to the ongoing etiology of political melancholia, which, as Wendy Brown and others have argued, continues to delimit American political discourse. In our moment, with Tea Party nativism misdiagnosing chronic unemployment as the result of lax immigration policy and not thirty-plus years of concentrated outsourcing, and with some polls reporting a that a majority of respondents understand Obama's capital-friendly legislative remedies to be somehow “socialist,” who could argue that genuine left alternatives haven't been disavowed or foreclosed? Mourning Modernity looks back to the early twentieth century for the entrenchment of today's melancholic political rationality, and argues that American modernism is a meaningful exploration of its dynamics. Moglen proposes that modernist writing alternates between a disaffected melancholia and a more politically engaged and reparative mourning, two structures of feeling he derives from Freud. Both are responses to the losses, injuries, and foreclosed possibilities imposed by an accelerated capitalist modernity at the turn of the twentieth century. But where melancholic works tend to naturalize or eternalize alienation—think of T.S. Eliot's mythic method in The Waste Land—the literature of mourning faces up to the causes of modern anomie and takes on the difficult work of identifying the mechanisms of dispossession that capitalism engenders. Some modernist texts, like Eliot's, adhere to one position or the other, but some others, like John Dos Passos's U.S.A. trilogy, oscillate between the two. Moglen uses the mourning-melancholia distinction to cut a materialist path through modernist scholarship in his book's remarkable first half. He argues that the diverse and productive modernist criticism of the past twenty years, or the so-called “new modernist studies,” can be reframed and politicized in a coherent way. Briefly, the field of American modernism was a mid-century, Cold War invention that, like Clement Greenberg's veneration of abstract expressionism, subsumed politics to a set of formal properties and promoted seemingly apolitical works that stood as cultural evidence for the arrival of the American Century. That melancholic, new critical canon has been gradually eroded by the new modernist studies' rehabilitation of authors, traditions, and genres initially marginalized or ignored, which are then leveraged against the cultural capital of high modernism. These rediscovered texts, Moglen claims, tend to feature more overtly political content that mourns the effects of monopoly capitalism on modern life, whereas the melancholic canon displaces alienation into self-negating strategies of formal indirection. If the concept of a new modernist studies sounds like a more general tendency in late twentieth century humanities criticism, then this may explain why it has been able to operate until now without a mission statement. The importance of Moglen's periodization is that it shows how both the melancholic and mourning traditions, or the modernisms of the new critics and the new modernists, can be constellated in a single field, as contrasting responses to the same historical conditions. But such a summary implies a starker division than what, in Moglen's book, is a far less reductive framework for American modernism. The literary works he includes in both the mourning and the melancholic traditions are carefully selected to avoid a belated canon debate, mixing authors rehabilitated by the new modernist studies with more canonical choices in each category: T. S. Eliot, Ernest Hemingway, F. Scott Fitzgerald, William Faulkner, but also Jean Toomer and Willa Cather write in the melancholic mode; mourning, on the other hand, is evident in the writings of Zora Neale Hurston, Tillie Olsen, Langston Hughes, but also Hilda Doolittle (HD) and William Carlos Williams. Instead, Moglen's focus shifts to these texts' affective dynamics: how does a widespread sense of loss, absolutely constitutive of modern experience, register in the writing of the period? What political possibilities does it prohibit or enable? Moglen argues that modernism is typified by an “experience of growing alienation, a crisis in the capacity for social solidarity at the public level, and for emotional and sexual intimacy in the private” (5). Where melancholia manifests itself in a series of psychic symptoms that have become definitively modernist affects (anxiety, war trauma, libidinal despair), the literature of mourning pushes through these to reflect on the forms of love, desire, and solidarity that existing social formations make available or foreclose. This is where Moglen's use of melancholia and mourning reveals its most suggestive possibilities: in its ability to link literary explorations of the most intimate registers of psychic life to the political, or to an often frustrated desire for social transformation and alternative forms of living. Mourning is, in a sense, another word for this desire, wherever it manages to avoid the psychic and representational displacements of melancholia and can “raise to consciousness” (22) the social forces responsible for injury and loss. But despite a series of terrific close readings in these early chapters that demonstrate the adaptability of his critical framework to a potentially vast range of modernist writing, Moglen's own analysis tilts the field towards what he sees in Olsen and Dos Passos especially as a “materialist form of mourning” (68): one that privileges a left-radical strain of literature as the most fully developed response to the losses brought on by modern capitalism. The second half of the book is devoted Dos Passos's U.S.A. trilogy, which was intended as a memorialization of the early-century radicals—Wobblies, anarchists, communists, unionists—repressed, executed, and deported in the Red Scare of the 1910s and 1920s. Dos Passos's trilogy alternates between four very different narrative modes, and two of them, Moglen argues, pit mourning against melancholia. The first mode, U.S.A.'s biographical prose poems of fallen radicals, were designed to produce a book “so fiery and accurate” (Dos Passos, qtd. in Moglen 125) that it “would prevent Americans from forgetting the suppressed traditions of democratic anticapitalism” (Moglen 125). This effort to mourn is attenuated by a second mode, the trilogy's narrative prose sections, which also treat the radical left; these, Moglen argues, ultimately succumb to a naturalist fatalism and a reified use of language that blocks mourning with an embittered political defeatism. The tension between the biographies and the prose narratives runs through the trilogy. Moglen also weaves in important events in Dos Passos's own biography, which is marked by an increasing frustration with the radical left and with his public image as the leading light in a proletarian literary movement of the 1930s—an estrangement that grows palpably over the course of the three novels, to the point where later decades saw him praise an idealized “Anglo-Saxon democracy,” make anti-Semitic dismissals of the US Communist Party, and then offer support for anti-communist luminaries like Joseph McCarthy, William Buckley, and Barry Goldwater. Moglen builds his case on solid ground here: if these aren't the self-consuming symptoms of a melancholic, I'm sure that I don't understand the term. A renewed interest in radical formations of the modernist period is a welcome intervention and, as Moglen's excellent close readings show, also a powerful heuristic for some of the era's more famously elliptical and difficult writing. But exploring modernist anti-capitalism also requires a renewed attentiveness to modernist-era capitalism itself. Moglen's term, monopoly capitalism, serves as a useful shorthand, but the risk of reifying a static picture of industrialization and urbanization should be clear. Modernist regimes of accumulation were neither monolithic nor monocausal, and Moglen's reliance on terms like “modernization” and “development” tends to obscure substantial temporal and geographical disparities in capitalism's effects—not only within but, of course, beyond America's borders. If critical sensitivity to a range of affective states will, as Moglen argues, provide a cognitive map to modern capitalism, then this might be usefully accompanied by a more thorough investigation of that era's self-representations of economic organization. The turn of the twentieth century saw the establishment of economics as an autonomous discipline, with its own internal disputes (for example the currently sanctified figure of J. M. Keynes, and the free market reaction against him detailed in Foucault's recently-translated Birth of Biopolitics lectures) and external critiques (especially the economic debates within the Second International, where the concept of monopoly capitalism originates), both of which point to a rather more unstable and contested object in monopoly capitalism than is typically understood. If further research could approach the range and scope of literary texts accommodated by Moglen's framework with analysis of a corresponding set of modernist-era representations of capitalism itself, scholarship in this area would be well served. All of which is to reiterate that capitalism itself is not static object, but a process that requires cultural mediation to sustain it. And if Moglen's study returns us to still-relevant questions of form and mediation, so much the better. For instance, one wonders how Moglen's paradigm can be applied beyond America to that rich strain of modernist art and writing – Futurism, Constructivism, (some) naturalism, automatic writing, and so on – that bases itself in a fetishism of machines, modelling aesthetic form after new kinds of technologically-mediated experience? This, too, was often based in revolutionary desire, if not actual revolutionary collectives and avant-gardes; its radical break with history and tradition, more a liberation than a loss, was seemingly free of melancholia's usual symptoms and self-lacerating structures of feeling. Moglen's reading of Dos Passos omits most of U.S.A.'s more formally experimental Newsreel and Camera Eye sections, which arguably participate in this machinic tendency in form. Instead, Moglen's analysis tends to privilege authors and works able to “raise to consciousness” the social causes of alienation, which applies more easily to texts with some conventionally realist, or at least representational, content in them. In this respect, Mourning Modernity bears more than a passing resemblance to the literary criticism of György Lukács, whose categories of “healthy” realist and “sick” modernist styles are in a sense an earlier iteration of Moglen's mourning-melancholia opposition.1 Lukács, too, was impatient with any mythical abstraction or eternalization of capitalist alienation: for him, realism named the ability of literature to foster historical self-awareness, and to keep open the possibility of socialism, within a concrete capitalist totality. If melancholia is indeed a political disaffection that set in with even the most committed of American modernism's leftist writers, and mourning stands for these writers' more politically responsible moments, then Moglen seems to share Lukács's aims. Mourning Modernity opens the door to reconsidering Lukács's categories outside of his problematic formal absolutism, with an eye to the variety of affective modes that historical self-awareness can take. This is no small achievement, and offers a key vantage on the constitution of America's resentment-filled present. Brown, Wendy. “Resisting Left Melancholy.” Boundary 2 26.3 (October 1999): 19-27. Foucault, Michel. The Birth of Biopolitics: Lectures at the College de France, 1978-79. Trans. Graham Burchell. New York: Palgrave Macmillan, 2008. Lukács, György. “Healthy or Sick Art?” Writer and Critic, and Other Essays. Trans. Arthur Kahn. London: Merlin, 1978. 103-109. —. “Franz Kafka or Thomas Mann?” Realism in Our Time: Literature and Class Struggle. Trans. George Steiner. New York: Harper & Row, 1962. 47-92. Evan Mauro is a Ph.D. candidate in the Department of English and Cultural Studies at McMaster University. His dissertation is entitled The Biopolitics of Sensation: American Modernism and Film, 1890-1930, and traces cultural implications of biopolitical state logics during the crisis of nineteenth century liberalism. Next Next post: Power of the People?